Our Middlesbrough Reads campaign will be making a series of generous book donations to children across the town to wish them a very merry Christmas. 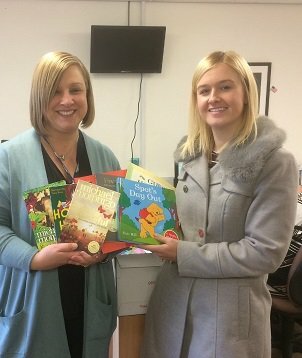 For the second year in a row, Middlesbrough Reads, in partnership with the Middlesbrough Promise and Public Health South Tees, has gifted books to Nepacs, a local charity promoting a positive future for prisoners serving time in the North East and their families. The organisation works to reduce the impact and stigma associated with offending and contribute to the positive rehabilitation of those it supports. Middlesbrough Reads recently received a generous donation of festive books from Penguin Random House to celebrate the National Literacy Trust’s charity of the year status. Hundreds of copies of Tom Fletcher’s The Christmasaurus are being delivered to several Middlesbrough primary schools and food banks. Almost 150 copies of the book have also been donated to James Cook University Hospital, which will be shared with children who will be spending the festive period on the ward. Thanks to a partnership with WHSmith, the Middlesbrough Reads campaign have given the hospital a Christmasaurus cuddly toy, which was awarded to Murphy Gill, aged nine.